Now more than ever we are always trying to keep to our budget and one of the first things to go is a nice takeaway coffee. A luxury we are told, not a necessity. Well, here is a secret among early morning workers passed along the grapevine. My partner has put me on to coffee at 7-Eleven. He is up early in the morning heading to work and regularly stops in for his daily caffeine fix. And, you know what, seriously it is pretty good coffee. At $1.00 for a regular coffee, $2.00 for large and $3.00 for jumbo, I thought it was exceptional value, made with freshly ground beans and fresh milk, not powdered milk and simply not bad at all. With 7-Elevens across Queensland, NSW, Victoria and WA, it has also become the perfect stop off for us before a footy game and fabulous pit stop for road trips where the kids can have a hot chocolate for $2.00 as well so it won't break the budget. Just think 5 coffees over the week, all for $5.00. Who said we have to go without. 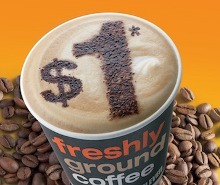 Simply the best value coffee around.